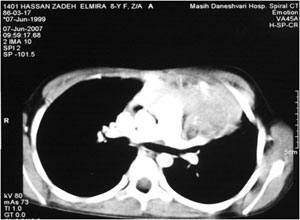 8 year-old girl with chronic cough and recurrent hemoptysis (about 100 cc) since 20 days ago admitted in our hospital. She hadn't fever, weight loss and anorexia. She had history of GERD in infancy that was admitted in hospital for 20 days and treated medically. No history of tuberculosis, in family. She has four siblings and her birth weight was 2/5 kg. Patient was conscious without respiratory distress. She was not hypoxemic or tachypenic. Percentile of height is 25% and weight 25%. 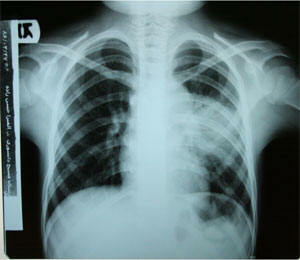 Chest: Heart sounds were normal, in auscultation of lungs diffuse fine crackles were revealed. 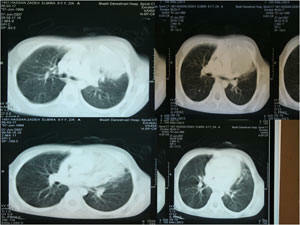 CXR= Mass Consolidation in left parahilar region with adenopathy in same side. 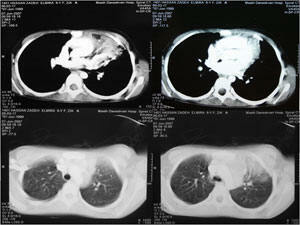 Lung CT-scan= Consolidation in anterior segment of LUL with left parahilar lymphadenopathy and mediastinal calcification.